I read this article and found it very interesting, thought it might be something for you. The article is called Root Canal Treatment and is located at https://www.dencaresmilecenter.com/endodontics/root-canal-treatment/. A “Root Canal” is a treatment method used to fix and preserve a severely damaged or infected tooth. 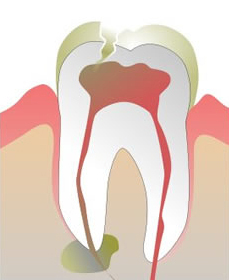 The phrase “root canal” originates from cleaning of the pathways or “canals” within a tooth’s root. Many years ago, root canal treatments were often painful and many patients were reluctant to have the procedure done. With modern dental advances and effective local anesthetics, most patients have little if any pain with a root canal. In reality, it’s probably more painful living with a decayed tooth. Alternatives to root canal therapy include extraction of the damaged tooth and replacing it with a dental implant, bridge or removable partial denture. Teeth have a soft, inner core called “dental pulp”. This pulp extends from the crown (the visible portion of the tooth) to the tip of the tooth’s root inside the jawbone. The pulp contains nerves, blood vessels and connective tissue. Whenever a tooth is cracked or has a serious, deep cavity, germs can get into the pulp. Left untreated, bacteria and decaying material may cause a serious infection or perhaps a tooth abscess, resulting in pulp death, bone loss and ultimately the loss of the tooth itself. Signs and symptoms might include inflammation around your face and neck, a hole inside your tooth, toothache or tooth pain, gum swelling, and temperature sensitivity. A root canal is normally performed by an endodontist or a general dentist. The root canal procedure typically takes one to three office visits. 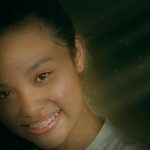 Initially, you will require dental X-rays to determine the extent of the damage to your tooth. You will also be administered a local anesthetic to control pain. A rubber-like sheet known as a dental dam is place in your mouth to help keep the tooth clean, protected and free of saliva. 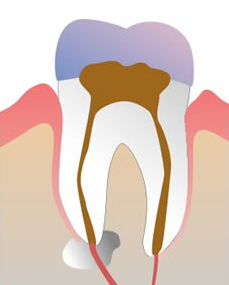 Decay is slowly removed, and an opening is made through the crown of the tooth to obtain access to the pulp chamber. Making use of small dental instruments, the infected or diseased pulp is removed. Once the diseased pulp is eliminated, the pulp chamber and root canals are flushed and cleaned out. 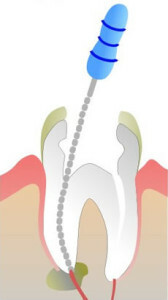 The root pathways can be reshaped and enlarged to provide better access for filling later. Prior to permanently filling the root canals, they should be cleaned of all infection and thoroughly dried. Medication may sometimes be place directly into the pulp chamber and root canal to remove any signs of infection. The tooth may be left open to drain for a few days. If infection has spread beyond the tooth, you may requirea prescription for antibiotics. Should the root canal requires multiple appointments, a temporary filling will be placed in the crown to safeguard the tooth and keep out debris and saliva. Refrain from biting or chewing with the tooth until it has been treated and fully restored. Following cleaning and drying, it’s time to fill the inside of the tooth — the empty pulp chamber and root canals. You may not require additional anesthetic for this particular step. 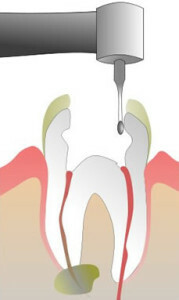 In the event you had a temporary filling placed, that will be removed to allow for access to the inside of the tooth. 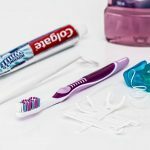 A sealant paste and rubberized compound is commonly used to fill the tooth, followed by an adhesive filling to ensure the root canals are shielded from saliva. The last phase of the root canal is restoration of the tooth. Since the tooth normally has a substantial filling or is weakened due to extensive decay, it must be protected from future damage and returned to normal function. Normally, this is done by placing a crown, a realistic-looking artificial tooth. A crown can be made of gold, porcelain or porcelain fused to metal. It is typically tinted to match the precise coloration of your other teeth. In some cases, a metal post must be inserted inside the tooth for structural support and also to keep the crown in position. Ask your Den-Care Smile Center dentist about other restoration options. After your root canal, your restored tooth with its new crown should function normally and appear cosmetically pleasing. If you follow good dental and oral hygiene procedures, your restored tooth could last a lifetime. The first few days following your root canal, the tooth might be sensitive. Over-the-counter pain medications may help. In the event pain or pressure continues more than a few days, be sure to contact your Den-Care Smile Center dentist. North Chicago Endodontics – What is the definition of Endodontics? Endodontics Lake County, IL – What signs and symptoms tell you that endodontic (root canal) treatment is needed? Root Canal – How long does it take for root canal treatment? Root Canal in Lake County, IL – Can a Root Canal can save a tooth? North Chicago Root Canal Procedure – Why are Root Canals Performed? Lake County, IL Root Canal Dentist– Are Root Canal Procedures painful? Root Canal Dentist Lake County IL – What should I expect after my root canal treatment? Root Canal Procedure – What is the success rate of a root canal? Affordable Root Canal Treatment in Lake County, IL – What is the success rate of a root canal?